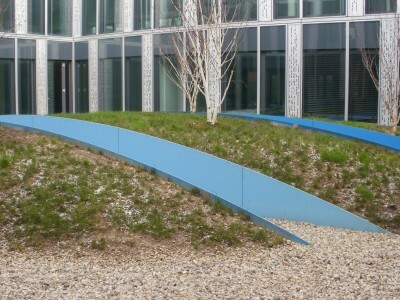 This pair of corporate gardens are overlooked on all sides by the surrounding offices. They need to look great all year round with minimal maintenance, and survive deep shade in winter and some intense sun in summer, exacerbated by the glass all around. 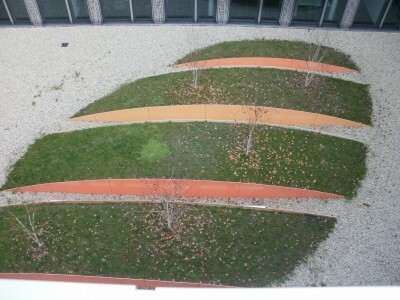 The previous design had included birch trees and grass, which looked dated and were not thriving. The brief also included a limited budget, access only by crane, and a tight planting schedule. 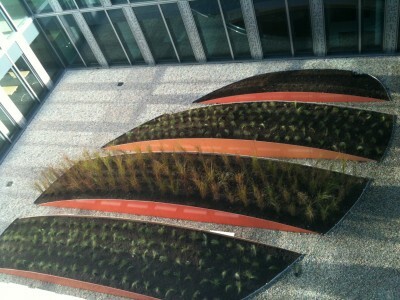 I chose a modern planting palette of ornamental grasses for year-round interest, and heat and shade resistance. 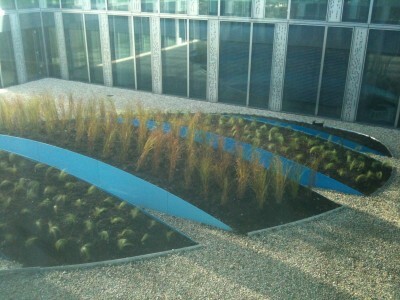 The grasses fit in well with both the red and blue colours of the planting beds. The landscape team from Fischer did a great job, and the new ornamental grasses, both shade and drought-resistant, have bedded in quickly, the clients are delighted and the maintenance schedule is hugely reduced.